Thousands of bib-sporting athletes hoof it from Stadium to the Sea. ASICS LOS ANGELES MARATHON: The mondo marathon weekend is starting in a Los Angeles-sized way, with a line of giant, skyward beams, courtesy of title sponsor ASICS, along the Stadium to Sea route. That's on Friday, March 13, but the big run pavement-pounds on Sunday, March 15. 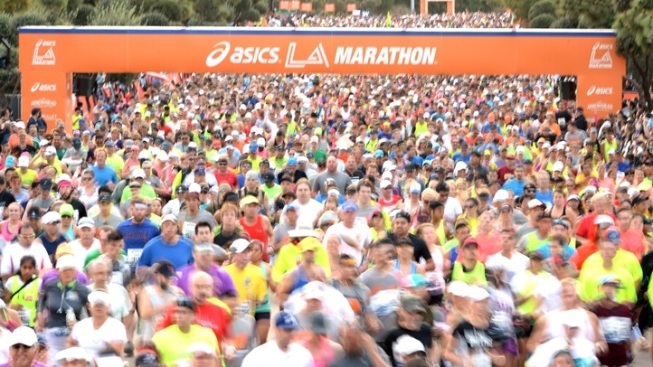 Dodger Stadium is the beginning, the Pacific Ocean is the finish, and thousands of you-go-ers shall line the route, cheering for thousands of people running their first or 30th LA Marathon. Three decades of world-class runmanship? That's worth finding some curb to commemorate. PIE DAY: There's no holiday that's about trigonometry and truffles, the chocolate kind, as far as we know of, but there is a just-before-springtime occasion devoted to pi, as in the ratio of the circumference of a circle to its diameter, and pie, as in the fruit-or-cream-or-more dessert folded into a tender pastry crust. It's March 14, every year, or 3/14, the first three numbers of pi. Claremont is celebrating with an apron parade, a pie eating contest, pie tastings, and everything sweet. If you want to haul along a portable blackboard, to show attendees your pi-related knowledge, well, that's probably cool. It's Pi Day, too. SIERRA MADRE WISTARIA FESTIVAL: Not every backyard has a plant that's made the Guinness Book of World Records, but a foothills-snug yard in Sierra Madre can make that claim. Make that two backyards, big backyards, where the World's Largest Flowering Plant grows. Grows a lot — it is well over 250 tons, and forges ahead several inches a day, or so it is said. Which is saying something: The famous wistaria has been purpling up that very spot since the late 1800s. Whoa, right? Right. Be there on Sunday March 15. A TRIP TO BUNKER HILL: Many an Angeleno recalls the day when Victorian manors sat atop Bunker Hill, and not the skyscrapers that now dot the downtown stretch. Travel back to that moment at the Egyptian Theatre via "Bunker Hill Revisited," a 60-minute documentary about one of our city's first neighborhoods. Also playing? A noir flick about "Angel's Flight," the last landmark on the Hill.